In this section, you will export the hourly DWF patterns created for weekdays and weekend, the groundwater inflow time series and the RTK parameters to InfoSWMM and InfoSWMM SA. 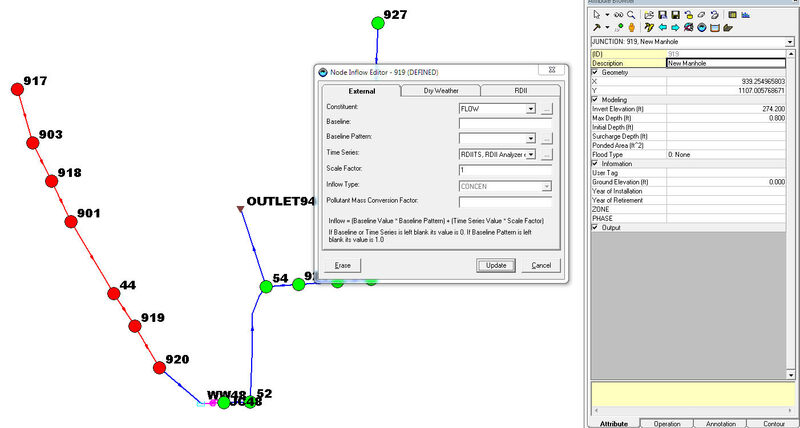 The exported data would be assigned to the nodes that contribute flow to the meter location. The allocation would be done equally among the contributing nodes. 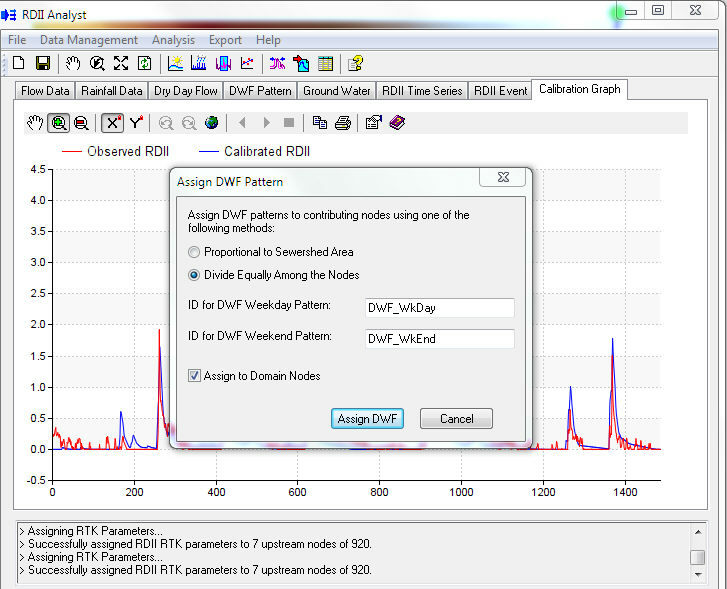 You can also save the corrected flow data and rainfall data, and the hourly DWF flow patterns to a file for later use. 1. From the menu go to Export -> Assign DWF Pattern. The following dialog editor is initiated. Specify the options shown below, and then click Assign DWF. 3. 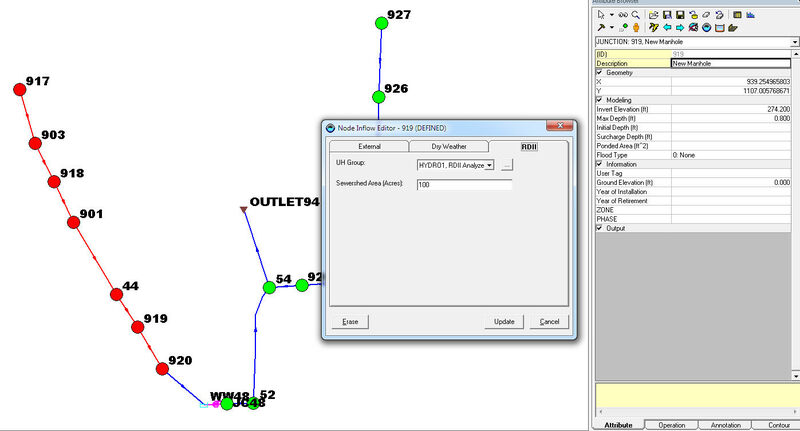 Note: After closing RDII Analyst, from InfoSWMM and InfoSWMM SA, select any node on the upstream side of Junction 920, and click on the ( ) button from the top of the Attribute Browser, then click on the Dry Weather tab and notice that hourly DWF patterns for the weekdays and the weekend are assigned to the node. 4. 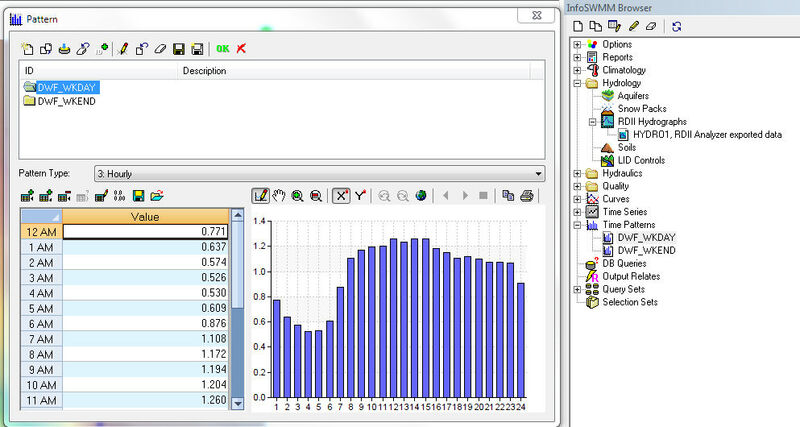 To export the groundwater flow time series, click GWI Time Series from the Export menu. Select the following options on the initiated dialog box, and then click OK.
5. 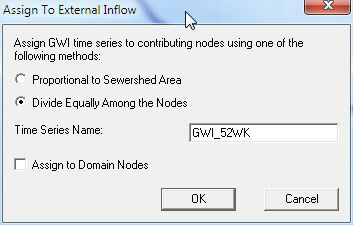 Note: After closing RDII Analyst, from InfoSWMM and InfoSWMM SA, click on any node on the upstream side of Junction 920, and click on the ( ) button from the top of the Attribute Browser, then click on the External tab and notice that the groundwater time series is assigned to the node. 6. To export the RTK parameters, click Assign RDII Time Series from the Export menu. Select the following options on the initiated dialog box, and then click OK.
7. 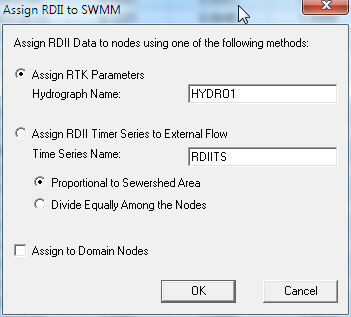 Note: After closing RDII Analyst, from InfoSWMM and InfoSWMM SA, click on any node on the upstream side of Junction 920, and click on the ( ) button from the top of the Attribute Browser, then click on the RDII tab and notice that the RTK parameters assigned to the hydrograph are the same as the optimal parameters identified by the calibration process. How the R (rainfall to flow fraction) and the T and K parameters (T*K or the Base of the Unit Hydrograph) are related visually. There are three R, three T or time parameters and three K parameters.